alaTest has collected and analyzed 59 reviews of LG OLED65E7 Series. The average rating for this product is 4.8/5, compared to an average rating of 4.3/5 for other products in the same category for all reviews. Opinions about the usability and sound are generally positive. The design and price also get good opinions. We analyzed user and expert ratings, product age and more factors. Compared to other products in the same category the LG OLED65E7 Series is awarded an overall alaScore™ of 96/100 = Excellent quality. LG's E7 OLED is one of the finest TVs money can buy, and is the best choice for those who like the finer things in life. The LG E7 OLED offers the best picture quality and user experience money can buy, but unless you need the slick picture on glass design and premium audio, the less expensive LG C7 OLED makes more sense. The LG E7 OLED TV delivers incredibly good image quality, but its no better than the C7 for $1,000 less. Med lekker design og utsøkt bildekvalitet er OLED-skjermen fra LG en sikker vinner. Läcker design och utsökt bildkvalitet gör LG:s OLED-skärm till en säker vinnare. 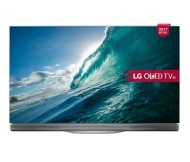 LG OLED 65E7V har en suverän kontrast, bottenlös svarta och imponerande ljusstyrka, vilket gör den till en utmärkt TV för sport, serier, filmer och spel. Priset är styvt och 65E7V får stå ut med konkurrens från andra LG-modeller som erbjuder mycket av samma bildkvalitet till lägre pris. Great picture. Need John Lewis to set up, no instructions came with TV, complicated still learning, need to print from the website. Brilliant tv with more bang for your bucks.